I wake early on a Saturday morning to a chill in the air, the thermostat on the wall showing a cool 56 degrees. I step through the door into the furnace room where my bare feet meet the cold painted concrete floor. A lift of the handle and the furnace door swings open. Waiting inside is a teepee of kindling flanked by two sticks of cordwood. Nestled deep inside the teepee is a fire starter made of compressed wood fiber and a flammable binding agent. I prepared the setup a couple days ago anticipating a planned cooldown according to the television weatherman. I crack open the small metal ammo box which holds my store-bought fire starters, a large box of “strike anywhere” matches and a couple butane lighters. I strike a match and thrust the burning stick beneath the kindling and ignite the fire starter. Close the firebox door and adjust the thermostatically-controlled draft, and I walk back into the house to prepare the morning coffee. By the time the first water makes its way through the basket of grounds and touches down inside the carafe, I hear the near-silent wisp of the blower and feel the warming heat beginning to fill the room. For some people heating with wood is the only option available. For me it is a personal choice, and I’m thankful for the decision each winter month when I receive my utility bill. But it goes much deeper than that. On a cold winter day when I walk into the furnace room on the back of my house and I feel the warmth and smell the faint scent of wood smoke in the air I’m instantly taken aback to my grandpa and grandma’s farmhouse and suddenly I’m six years old again. On cold winter days, the Ben Franklin stove which stood proudly in the living room of the tiny house was always going, working in tandem to keep the place warm along with the wood-fired cook stove in the kitchen. In the mornings the house always smelled of fresh-cured bacon, thick slabs grandma had carved herself from the belly of a hog raised right there on the farm and now sizzling in a black cast iron skillet. Nowadays, as a special treat sometimes, on a Saturday morning when we’re working around the place my wife will fry up some salt pork and make a big “farmer’s breakfast” for the family. There’s few things in life that I can think of that would smell any more inviting than a wood fire burning in the furnace or fireplace and salted bacon sizzling on the stove. But like so many basic things in life, heating with wood isn’t nearly as easy as it might appear. Anyone who’s ever relied on wood for heat can testify it’s a lot of hard work. Still, it’s one of the most cost-effective and renewable ways of staying warm known to man. A stand of timber can renew itself in about 20 years on average. Just a few trees can provide enough wood to heat an average-sized home for an entire winter. In many cases, firewood can be scavenged for free at logging locations, or from landowners looking to remove some trees. Most times the trees are already down and the owner of the wood simply wants it removed from the property. Just keep in mind that all free things aren’t necessarily gifts. All wood will burn, but not at the same rate and efficiency. Not all wood is created equally. A mix of seasoned and less seasoned can work well, and different species offer different heating properties. Just like men, not all wood is created equal. As an example, seasoned oak is ideal for heating but I wouldn’t want to drive a nail in a dry oak board. 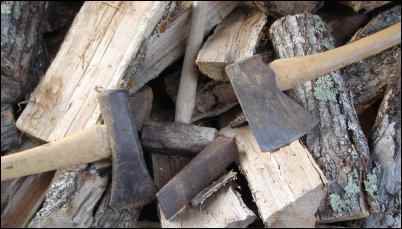 Hickory makes good ax handles and is also ideal for firewood. Cedar is a good bet to line a closet or dresser drawers but I wouldn’t want to fill my homestead woodstove with it and try to sleep through the night. The fire would be dangerously hot for an hour or two and then the house would be freezing by sunup. Fuel wood should be considered based on recoverable British Thermal Units, or BTU’s. As a brief explanation, BTU’s are a measure of energy and one good way to compare woods for burning. We also want to consider ease of finding, harvesting, lighting and the amount of creosote each produces. But back to BTU’s, scientists say one unit is the amount of energy needed to heat one pound of water from 39 to 40 degrees Fahrenheit. A fair comparison can be made by looking at the heating capability of equal amounts of the more common species of wood. For this comparison let’s use 128 cubic feet, an amount commonly known as a “cord”. Here’s where things can get squirrely. The measure of a quantity of firewood, and the name by which it’s referred to, changes based on geographic location and local traditions. Where I live in the Ozarks a rank is a stack of seasoned wood four feet tall, eight feel long and made up of 16-inch long pieces. But some folks call that a “rick” of wood. Using that amount as a reference, three “ranks” or “ricks” totals what is commonly called a “cord” of wood. Following that train of thought, a cord equals 128 cubic feet of wood. But not only are the names different from place to place. In different areas wood is bought and sold in different ways. Where I live most wood is sold by the rank, but sometimes a wood cutter will sell by the pickup truck load. The buyer has to be able to look at the load and tell if he or she is getting a fair price. Each year I cut a portion of my own firewood and buy the rest. If I’m purchasing from a new supplier I will have a rank or two delivered, or one truckload. I’ll go the extra step and stack that first load to assure I’m getting what I’m paying for. Honest wood suppliers will give you an accurate amount and a little bit more for good measure. In the early years of our marriage my wife and I cut and sold firewood for extra income. We’d always give the customer a little more than promised, and we quickly grew a customer base that stayed with us until we moved on to other endeavors. Now back to the comparison of woods based on recoverable BTU’s per cord. According to Hearth.com, hickory offers the most heat by volume. Cottonwood is the poorest choice for heating. Here’s a comparison of the most common wood species. In general terms you want to avoid using softwoods for heat. They burn too hot and fast, leaving you with a dangerously hot fire at first and not as much as a decent bed of coals an hour later. We’ll discuss fire safety later, but just know that a fire that’s too hot can crack the metal or glass of a heating stove and, more importantly, permanently damage a masonry flue. And burning softwoods puts too much sap and creosote into the chimney which can make your system more prone to a flue fire in the future regardless of whether the flue is masonry or metal. The only softwood I use is pine and cedar lumber scraps I cut and split into small pieces for kindling. I cut the pieces about six to eight inches long and split to about the thickness of a pocket knife and smaller. When I have an available hour or two in the fall of the year I cut my pine and cedar lumber scraps to length on the table saw or with a circular saw. Then I sit in the garage or outside under a shade tree and split the kindling with a hatchet. I’ve even invited a buddy over, who also heats his home with wood, and we work together at splitting enough kindling for each of us while at the same time shooting the bull. I fill a couple five-gallon buckets with the pieces and seal with lids. One bucket sits near the furnace at the ready until empty, at which time I replace it with another. Two buckets will usually last me through most winters. The right tools make any job more enjoyable. For splitting wood that means, left to right, a splitting maul, wedge and hammer, and axe. Another use for pine is as a fire starter. Sap-rich pine knots can be busted into small pieces and used to ignite kindling. Grandma used to keep a dozen or so pencil-sized strips of kindling soaking partially-emerged in a coffee can half filled with lamp oil to use as fire starters in her wood cookstove. While I’m a big fan of the traditional ways, I tend to go the more modern route and rely on store-bought fire aids. Each fall I buy two boxes of fire starters made of compressed sawdust. They come in roughly four-by-eight inch slabs perforated to be broken into smaller squares of about two-by-two inches, and each square will burn for about five minutes – plenty of time to ignite dry kindling and wood. I keep the fire starters with my matches and a butane lighter or two in a waterproof Army surplus ammo container that sits beside the furnace. In nearly 20 years of heating with wood I’ve never had the fire starters or matches draw moisture inside the sealed box. Any good Boy Scout can name a half dozen designs of stacking tinder, kindling, and wood to start a fire. It’s been a while since I went through Scouts, and even a dozen years since my son was in a troop, but I assume earning one of the badges still requires starting a fire with one match. Fortunately starting a simple fire in the heating stove doesn’t require that level of survival skills, but still, using a few proven techniques makes it more of a sure thing. A warming fire starts with good kindling. Pieces split from discarded pine lumber works well and costs nothing. A hatchet works well for making small pieces out of bigger ones. Here’s how I do it. With all but the first fire of the season (at which time the stove has been completely cleaned following the previous winter) I’m usually dealing with a furnace firebox that contains a bed of ashes. My furnace has a fire grate that holds the wood up well above an ash box with a separate draft and cleaning door below. The goal is to build a fire that will burn hot enough but not so hot as to waste fuel. To do so I’ll start by using a fire poker to scrape clean a small area of the fire grate, about eight-by-eight inches or so. That gives me a good area for the draft to move past the flames. The remaining bed of ashes helps nestle the firewood and cause it to burn slower. On the cleaned grate area I’ll put two fire starter squares down. 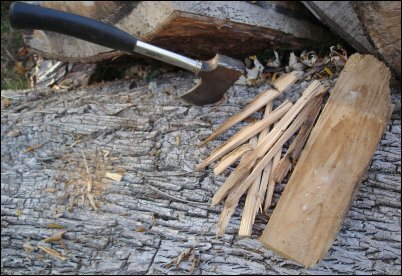 Then I’ll grab a handful of kindling from my bucket and build a simple teepee or lean-to shape over the starter squares, leaving plenty of space between the sticks for air flow. I’ll lay a couple regular-sized pieces of firewood down each side of the kindling teepee, and span the gap between the two with a couple of smaller pieces of wood hovering above the teepee. Now my fire setup is ready to ignite. Oftentimes I’ll build the setup in the stove the night before I intend to light the stove. The next morning it’s a simple as sticking a match to the fire starter, closing the firebox door and cracking open the draft. Within minutes the fire will catch up and the stove’s blower will kick on pumping cozy warm air into the house. Just like no to woods sharing the same potential BTU’s, not all wood ignites the same either. Woods that ignite fair to good include hemlock, ash, white birch, elm, and hickory to name a few. 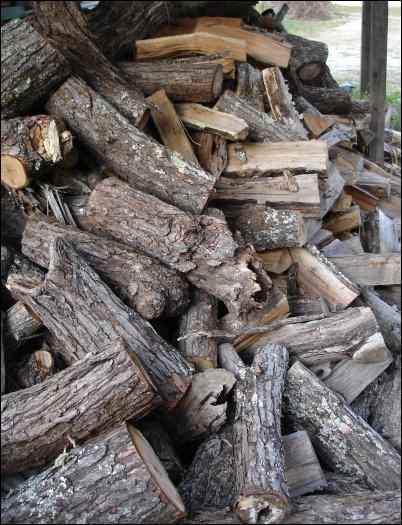 Wood that is hard to light includes cherry, black locusts, beech, apple, red oak, and sugar maple. As mentioned earlier, not all free things are necessarily gifts. I often see ads in the newspaper or on local blogs or hear someone on the radio giving away free wood for the cutting or hauling. While that can be a great way to get in the winter’s wood, just realize that if the trees you’re getting for free are sugar maple, apple, beech or some other ornamental “yard” tree it might not be the best option for heating. Options for using wood for heat haven’t changed too much in the past 100 years. While stoves are not the primarly focus of this article, let’s talk briefly about what’s available. Efficiency has improved with newer designs, but we’re still left with the same few options … open fireplace, fireplace insert, free-standing space heater, or a furnace connected to ductwork. Sure there are pellet stoves and multi-fuel combination heaters that burn pellets or corn, but for this article we’re focusing on burning sticks of wood. Of those choices, the space you wish to heat will best dictate the heater you choose. Homes with basements are great for wood furnaces with attached ductwork. Not only does such a system effectively move heat up and through the house by the air in the ducts, but you also can capture some of the residual heat that radiates from the furnace and flue pipe as well to heat the main level floorboards. Our home was built in the 1880s and has a thick stone foundation crossing beneath the middle of the house where the original back wall stood. I’ve never been a big fan of carrying firewood into the house, so we opted for a wood furnace installed on an attached, glassed-in sun porch. We ran the lines through the attic with the ducts in the ceiling. It’s not the best situation, but it’s what suits our situation the best. Homes with open floor plans or other heat sources with the intention of using wood only as a supplement in one area can be good candidates for free-standing stoves. And positioning the stove in the correct area of the home can send heat up a staircase to heat upstairs rooms as well. Open fireplaces are romantic (my wife tells me), but nearly any fireplace can benefit from an insert to maximize efficiency. For guidelines on locating and installing a wood-burning unit consult your home insurance provider. Companies will have mandatory guidelines on setbacks and materials used, and failure to install a wood burning unit the right way could result in having your insurance policy canceled, or invalidated in the case of a heat-related incident. And it goes without saying that you should clean the chimney at least once a year, at the start of the heating season, and more often if your system is prone to creosote buildup. I have my own brushes and rods and do the chore myself, but even hiring a chimney sweep for an annual cleaning and inspection would still be cost-effective protection against a costly and potentially deadly fire. There’s an old saying that “He who cuts his own wood warms himself twice… once when he cuts it, and once when he burns it.” My research hasn’t revealed who actually made that statement first, but I assure you whoever it was knew something about heating with wood.